X loves laksa a lot, but because it’s hard to get the ingredients to make laksa from scratch overseas, we stock up on laksa premixes whenever we go back to Singapore. Each box of premix makes enough for 3 (nowadays 4 as I try not to consume so much of the soup), so I will always end up with extra laksa soup – and there is absolutely no way I’m going to let that precious (hard to get and the premix is rather pricey) and delicious soup go down the drain. 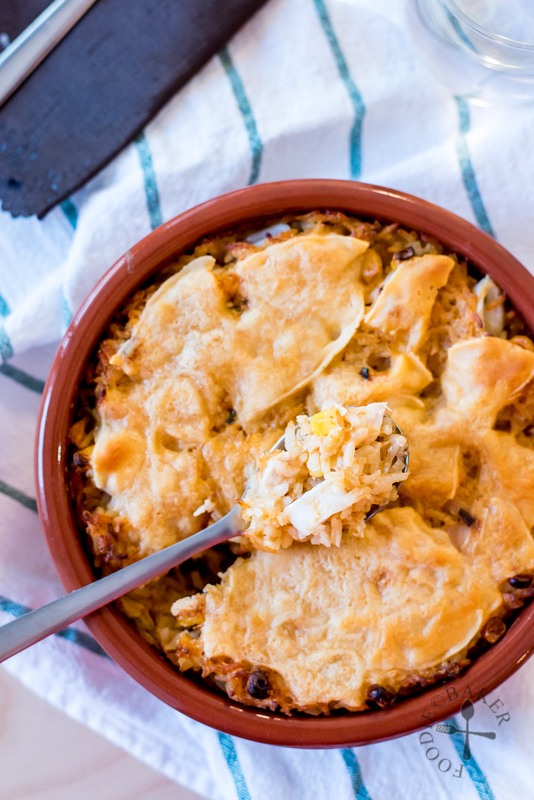 The leftover laksa soup will get stored in the refrigerator and the next day I will use it up – not by whipping another bowl of laksa (because I don’t want to cook the same thing again), but in this fusion dish – Laksa Baked Rice! Laksa is a popular Peranakan (also known as Nyonya) spicy noodle soup dish in Singapore, Malaysia and Indonesia. There are two main types of laksa – curry laksa and asam laksa. Both types of laksa require the rempah to be made first. Rempah is a spice paste, made by pounding shallots, garlic, galangal, chilli, dried shrimps, belachan (dried shrimp paste), candlenuts and lemongrass together in a mortar and pestle (nowadays, many just use the food processor). The rempah is then stir-fried in oil until fragrant, before freshly squeezed coconut milk, and/or stock (made with chicken and/or prawns) are added. For asam laksa, asam (tamarind) will be added, giving it a sour taste. The laksa soup is then ladled over boiled noodles, and served with chicken, prawn, fish, sliced fish cakes, bean sprouts, tofu puffs and/or cockles, as a meal on its own. 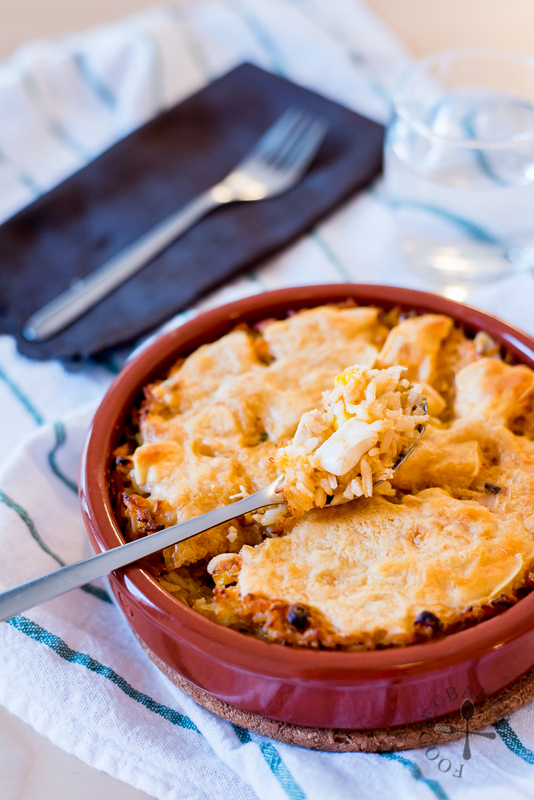 Baked rice is made usually with canned cream soup, cream, milk etc, basically with something thick, rich and creamy. As laksa soup is quite thin (but extremely rich in flavours), I made it slightly thicker with the help of a roux. 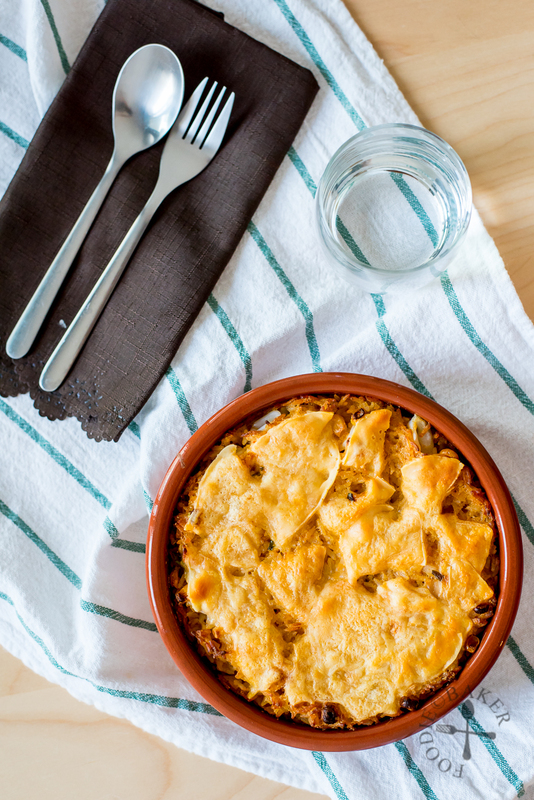 The soup is then combined with cooked rice, meat and vegetables, scraped into a casserole, topped with cheese then baked till the rice is piping hot and the cheese is melted and golden-brown. The result? Cheesy goodness, explosive flavours and an extremely satisfied husband 😆 The only regret I had was that the photos didn’t turn out as good because the sun was setting way too fast now that it’s autumn; and that the mozzarella cheese did not melt into stringy strands for a good photo – and I think this was because I baked at 200°C which caused the proteins in the cheese to tighten up, resulting in rubbery cheese instead of gooey cheese. Hence I lowered the temperature to 180°C in the recipe below. Luckily, I still have a box of laksa premix left, so if I get to make Laksa Baked Rice again, I will update with better photos! Here are the step-by-step photos and recipe! 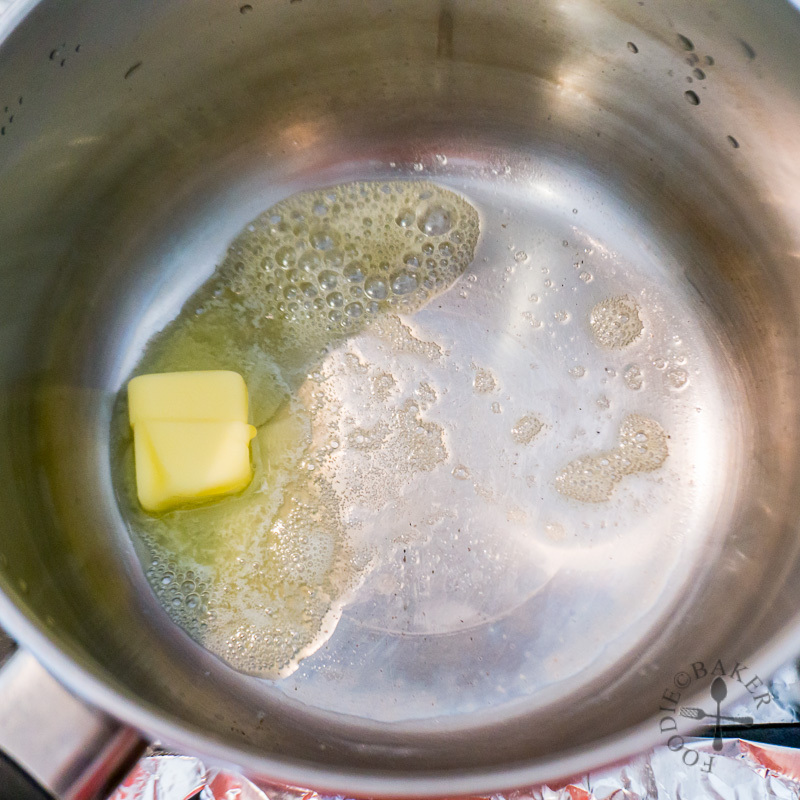 1) Melt butter in a small pot. 2) Whisk in the flour and cook over medium heat, until the roux is smooth, no lumps of flour remain and is of a light brown colour. 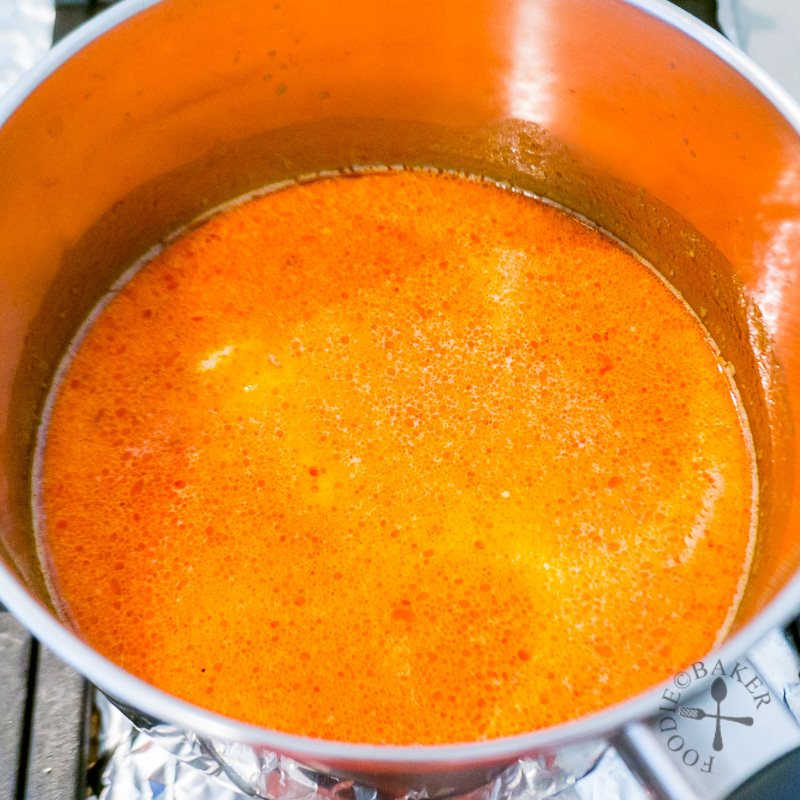 3) Pour in the laksa sauce and bring to a boil, stirring constantly. 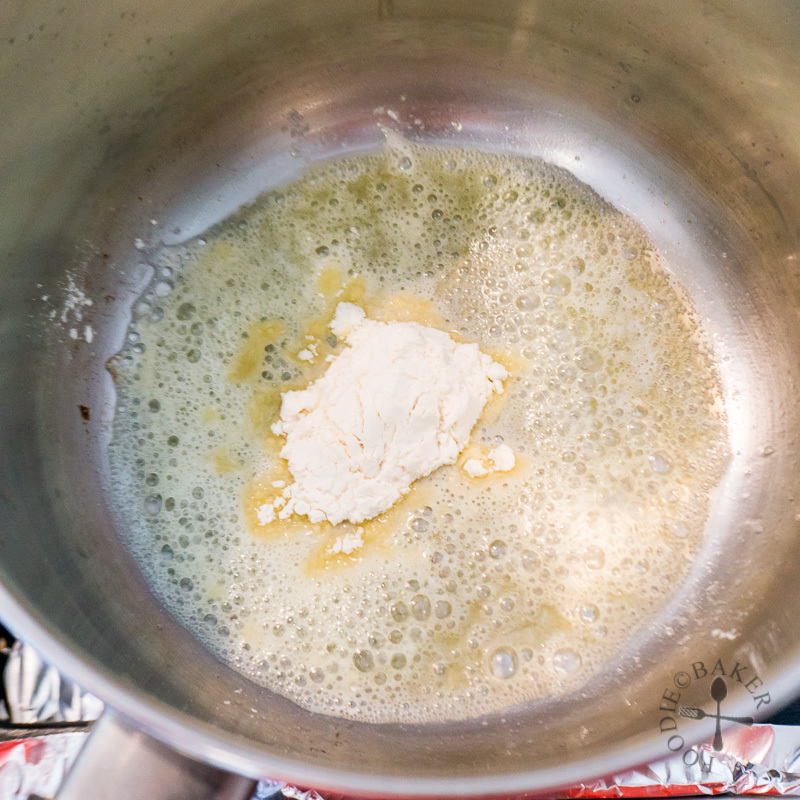 The sauce should thicken slightly into a cream soup consistency. Remove from heat. 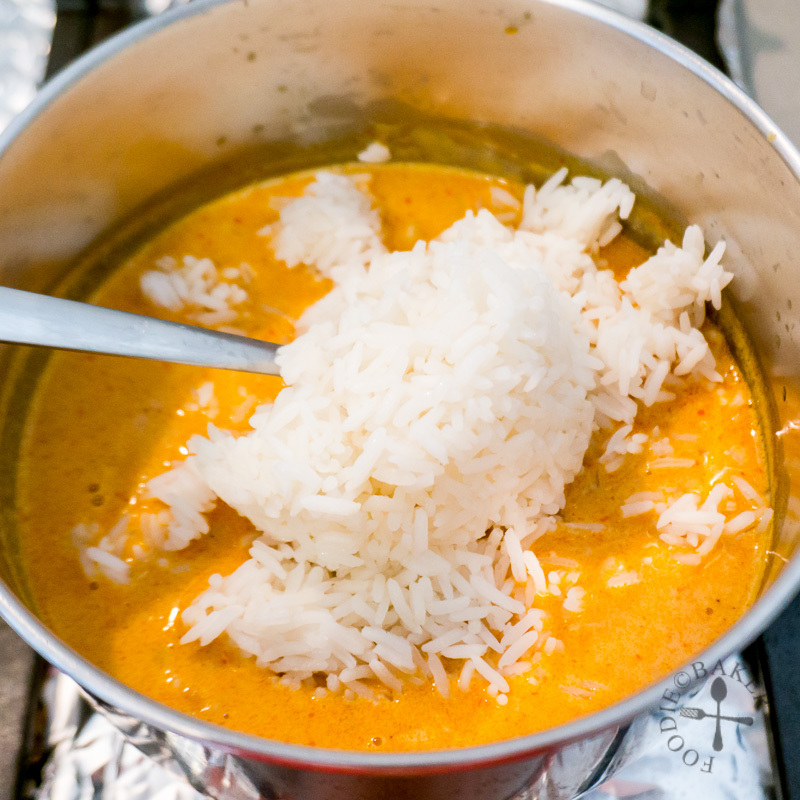 4) Add the rice into the laksa sauce, breaking up the rice to ensure every single grain is coated with the sauce. 5) Stir in shredded chicken and other desired cooked vegetables. 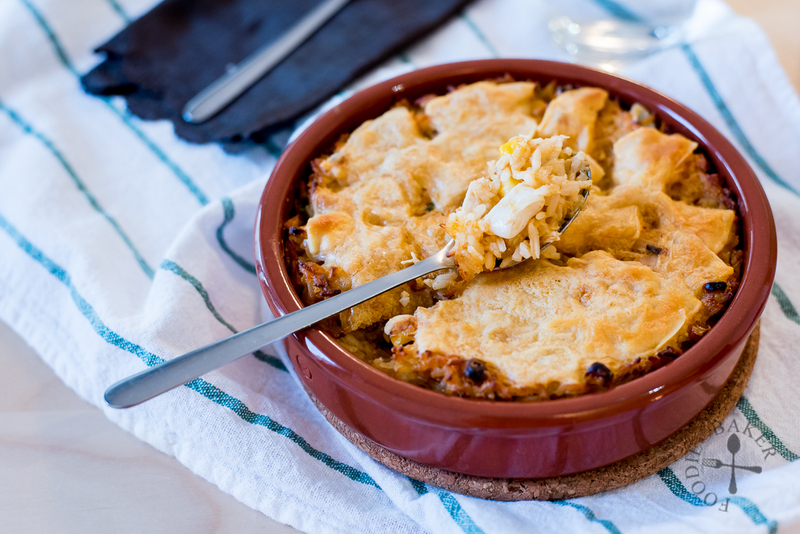 6) Scrape the mixture into a casserole dish and top with shredded mozzarella. Bake for 15 minutes until the rice is piping hot, then turn up the broiler and broil until the cheese is golden. Enjoy! Preheat oven to 180°C / 355°F. Heat a small pot over medium heat. Add in butter and once the butter has melted, whisk in the flour. Whisk constantly, cooking over medium heat, until the roux is smooth, no lumps of flour remain and is of a light brown colour. This whole process takes about 2 to 3 minutes. Pour in the laksa sauce and turn up the heat. Cook, stirring frequently, until the sauce comes to a boil and thickens slightly into a cream soup consistency. Remove from heat. 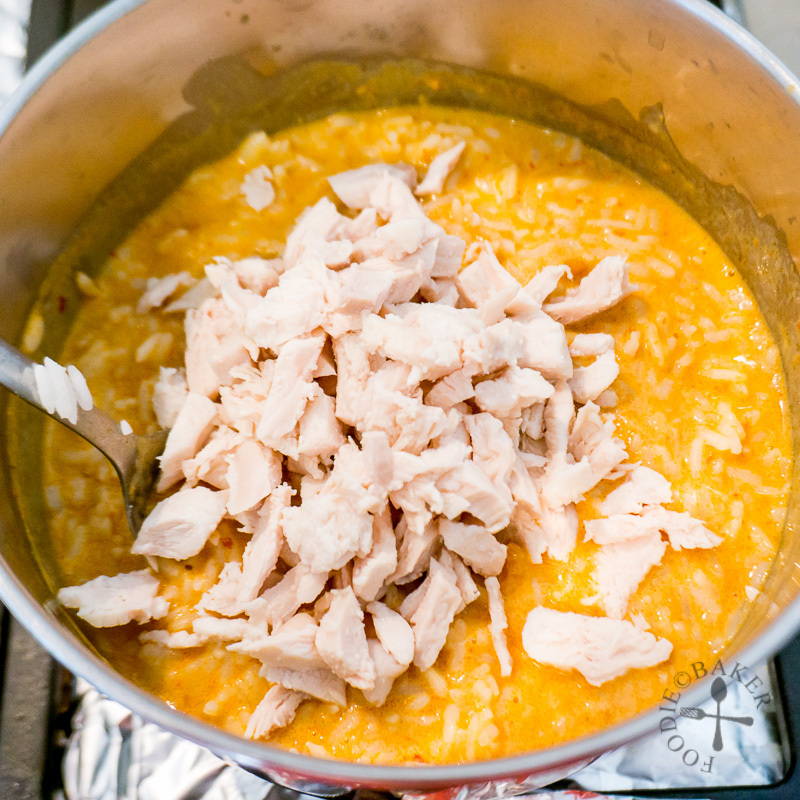 Add the rice into the laksa sauce, breaking up the rice to ensure every single grain is coated with the sauce. Stir in the shredded chicken and vegetables. Scrape the mixture into a casserole dish and top with shredded mozzarella. Bake for 15 minutes until the rice is piping hot, then turn up the broiler and broil for 3 to 5 minutes, until the cheese is golden-brown. Serve while it's hot! - ¾ cup rice cooker cup of uncooked rice (1/2 standard cup or 115 grams) yields 1½ standard cups of cooked rice required for the recipe. - It's best to use overnight rice so the rice doesn't become mushy when cooked. If you are cooking the rice on that day itself, reduce the water a little so the rice is drier. 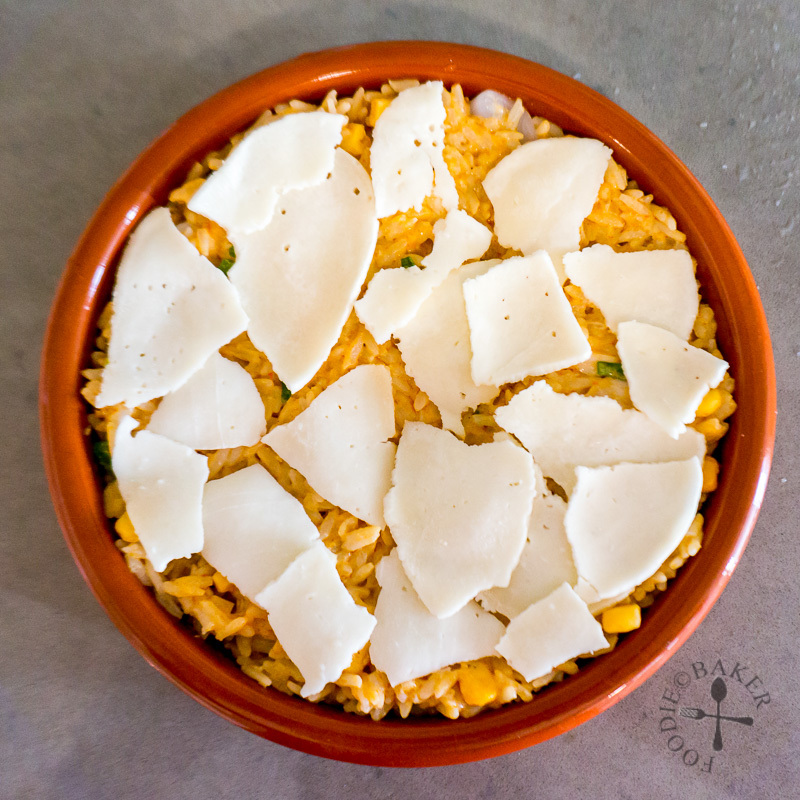 - If you like it super cheesy, stir in additional cheese into the rice before topping with even more cheese. I use only mozzarella as I don't want the flavours of other cheeses to clash with the strong-tasting laksa. That is a great idea! Love the spices and herbs of of laksa so why not have it in a rice dish. This is a nice fusion of Hong Kong, Malaysian and Western Cuisine in one. Love it!